Hi Everyone. I have an '07 and my alarm seems to have immobilized the bike. Does anyone have pics of the jumpers used at the 12 pin connector. Looking for the best option before I ruin it. Before you do anything press the arm (ribbed) and disarm (smooth) buttons on the FOB several times and see if the bike responds with the beep and flashes. If it does then turn on the key and press the disarm button once and see if the bike starts. If it does then you just need to re-program the alarm to turn off the immobilizer. Check fuse F4 and see if it is blown (if it is your horn will not honk). If it is blown replace it and if it blows again your alarm is toast. To get the bike running again you need to jumper the following pins on the 12 pin connector. Pin 3 (black/white/yellow) to pin 11 (black/yellow); this is the starter button signal to the starter relay. Then jumper pin 10 (green/violet, switched power) to both pin 2 (Green, flasher module) and pin 6 (blue/violet, engine electronics relay). This is the color code for the connector in the bike side of the harness. You may want to cut the 12 pin from the alarm harness and jump those wires (same pin #'s but different colors) together and plug it back in. That way you can always get a new or used alarm and easily install it. The pin #'s are visible on the connectors. Last edited by jzeiler; Feb 19th, 2019 at 10:22 am. Apologies if I am jumping the shark since this isn't my thread but John I see you are using the same pic I saw for a 2003 disable. I got the bl/wh/yellow wire joined to bl/yellow, however I am not seeing a green/violet(P10) or blue/violet(P6). please advise, thank you. I took your advice and cut the pigtail and connector from the alarm and aim to plug it back into the male receptacle. The wire colors are different on the short plug and I don't have them handy. Just use the readable pin numbers and for 2003 you just jump two pairs only pin 3 to pin 11 and pin 10 to pin 6. 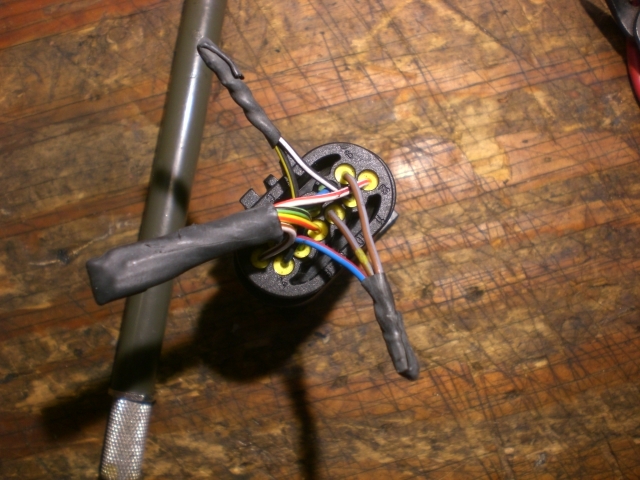 Check the wires to the pin with a multi meter to make sure you get the right ones. For the 05 and up you add pin 2 to pin 6 and 10 as they powered the flashers differently. If you add pin 2 to a 2003 your flashers will be on all the time. Thanks for the reminder, haven't had much coffee today, lol...standing around with it in my hand. Anyway, the 6 wire looks very much like the 12 wire so I am going to either tug on it from one end or just cut off the rubber shield and re-wrap it after I am sure. It looks like there is a gray stripe on 6 but upon examination with magnifying glass I don't think so, anyway thanks again! Yes pin 6 is a brown with gray stripe and pin 10 is a brown with gray stripe and yellow spots. You have the correct wires. If this was an 05 you would also add the pin 2 wire which is blue with a red stripe. The other pair is pin 3, black with yellow stripes and pin 11, black with white stripes. You made me go back out and look at my emergency jumper that I carry in my saddle bag. I needed to document those wire colors anyway. Looks like my alarm has gone down as well, fuse 4 blows all the time with no horn or brake lights. The engine still runs and and bike rides. I assume it will need the same by pass as well. My LT is a UK 2004 making it a USA 2005 variant. With the alarm still connected on the bike and the 15 amp fuse blown the engine runs and rides as normal with the exception of the brake lights and the horns. As the engine runs I am assuming that the alarm is in the state with the immobiliser switch off as its allowing the engine to run etc. Looking at where the 15 amp fuse is connected to its one the 3 pin connector to pin 1 (red / white wire). 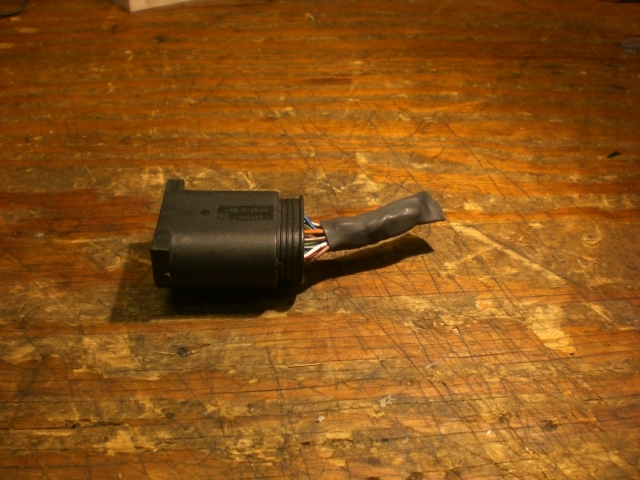 As that pin is dead due to the fuse blown, it looks like I could just cut this wire leaving all the other connectors in place without the need to short out other pins to enable the engine start / run relays to operate allowing the engine to start and run. Thus allowing me to replace the blown fuse. Is this a practical option or is it storing up future problems with the engine immobilisation system? You can just unplug the three pin connector to remove the short. 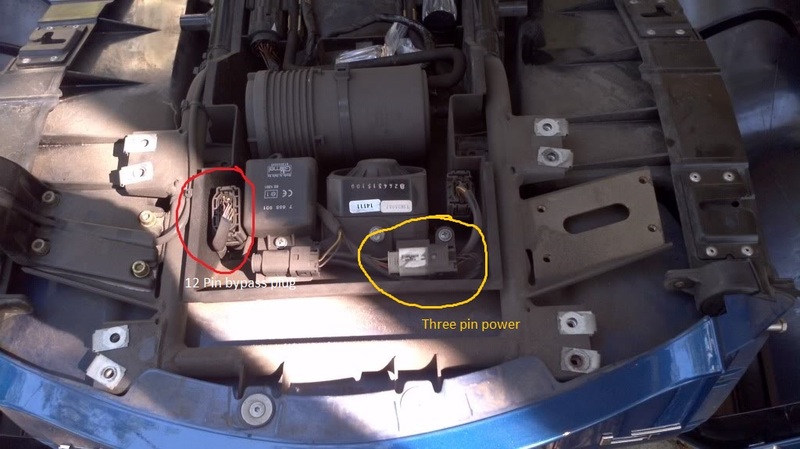 This photo, with the connector circled in blue, is an earlier bike but the facelift connector is similar. Your connector will have a Green, a Red/White, and a Brown wire. 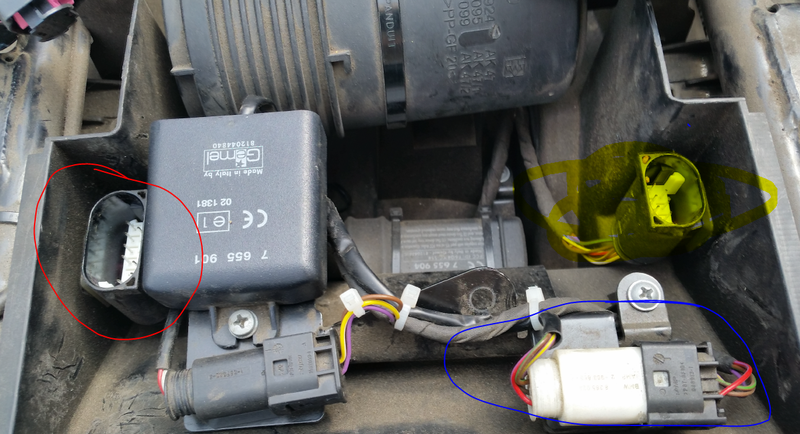 With the 3 pin connector unplugged the engine will not start the immobiliser is as though its in the active state. In the end I just cut the red / white cable and can hear the relays operate allowing the engine to start. Central locking is dead as expected, the alarm indicator on the dashboard is inoperative and the brake lights and horn now work. Just need to bleed the brakes for its annual MOT (road worthy test) which have already been bypassed. That means that there is still some type of functionality in the alarm that requires the switched power (green wire) to operate and allow the relays to operate. Most people just do the bypass on the 12 pin but if it is working I would leave well enough alone. Thanks for the feed back. Have you gotten an MOT on a bypassed unit before? Just curious if they catch it. I agree there is some form of functionality left in the control unit / alarm that's allowing the simpler method of cutting just the one wire to work. I did think of trying to break open the alarm to get the battery out of it. Had second thoughts though as the alarm has some functionality left. and in the end cut the wire in a place that would allow me to solder it back together if ever I decided to try and break open the alarm to get the battery out of it. Its had its 3rd MOT with the ABS bypassed will be the 4th soon as time out on the free retake after failure, and has flown through the MOT like that, As long as you remove the ABS relay under the petrol tank which disables the one ABS nag light, and disable the other ABS nag light on the dashboard which there are a couple of ways to do, If you have bulbs in the dashboard just take the bulb out. On later ones its either strip the dashboard to get access to the LED and cover it so the light can't be seen. I took the second option and cut pin 9 on the abs pump. As you have to take the electronics unit off the abs pump to disconnect the servo motors I cut the pin from the board to the plug. Some will take the pump off and seal the circuit board so water can't get to it and save a fair bit of weight. I put ii back on to the unit and refitted it. I did take off all the solid brake lines off the pump. You do have to fit a couple of link brake pipes which are available from Moto works or Motobins in the UK (can't remember which one it was I got mine from. Makes the bike simple to bleed the brakes and far more reliable and better in my opinion, added to that I replaced the rear brake disk / rotor to get rid of the cow bell noise last year.